A family favorite! 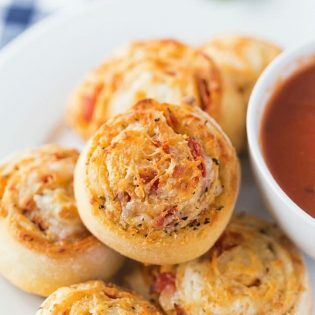 Homemade pizza rolls put a new spin on pizza night! 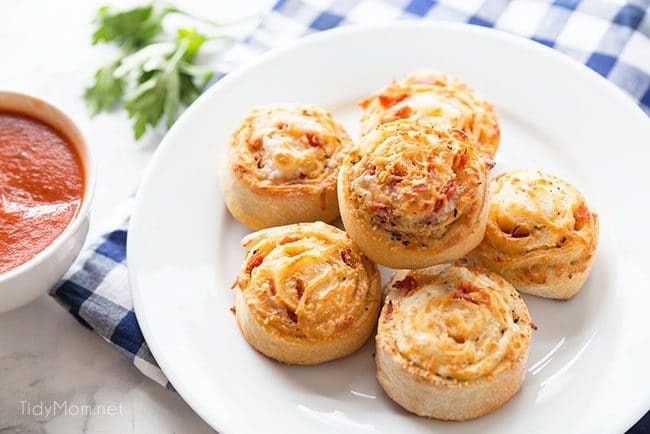 Stuffed with cheese and pepperoni what’s not to love about a pizza pinwheel? We love pizza at our house. Sure sometimes it’s just easier to order pizza in or pop in an oven-ready pizza. We only have one place that will deliver to our house, and it’s the only food we can get delivered, so we’ve grown very tired of their pizza and it get’s expensive. As much as I love to bake, I don’t always enjoy cooking.…..yet my family continues to ask “What’s for dinner” EVERY. SINGLE. NIGHT! geeze…..didn’t I just feed them LAST night?! So I have come up with something they will like/eat and something I don’t mind making. Homemade pizza is usually a hit with everyone!! We’ve grilled pizza made garlic chicken pizza, even made these calzones with pizza sauce and toppings. I’m always looking for ways to change it up so it doesn’t always feel like “pizza again“. 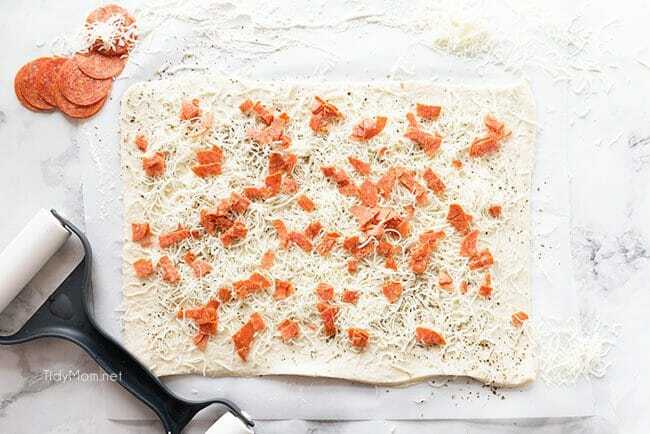 I haven’t experimented with making our own pizza crust yet……..that’s next on my list. 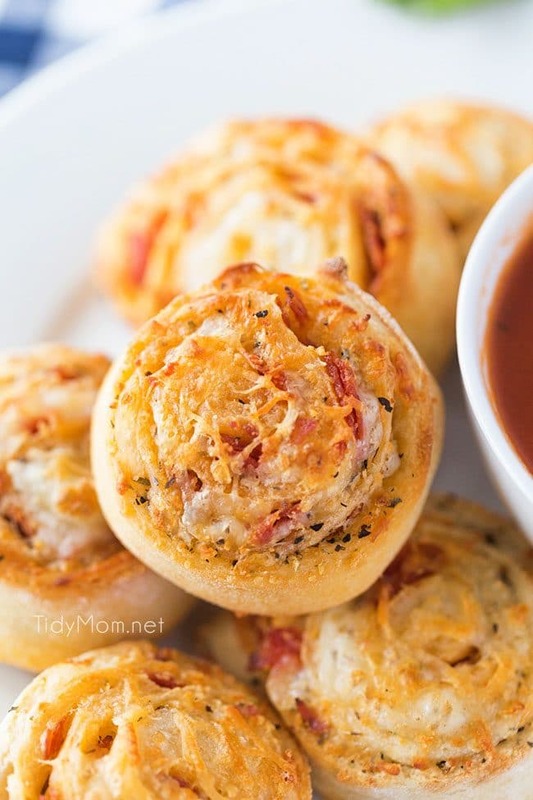 These homemade pizza rolls have now become one of our favorites! They were even tasty the next day leftover and cold! *you can make this with whatever pizza toppings your family likes. You simply start with pizza crust, I just use the kind that comes in a can. Roll it out, season with a little garlic and Italian seasonings. Next, starting with one of the short ends, roll the pizza into a tight log. Then, using a serrated knife, slice into 1-inch sections and place on a lightly greased pan and sprinkle with more cheese. Place in the oven for 10-12 minutes and serve with your favorite pizza or marinara sauce! 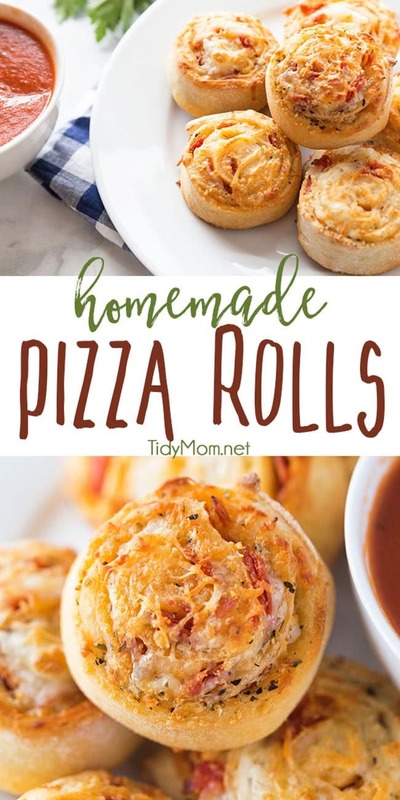 CHECK OUT HOW EASY HOMEMADE PIZZA ROLLS ARE TO MAKE! WATCH THE VIDEO! For more great pizza recipes that the whole family will love, you’ll want to check out my recipes for Black Bean & Chicken Taco Pizza, Pizza Pancakes, and BBQ Chicken Pizza Soup. This Pizza Stuffed Mushroom recipe, BBQ Chicken French Bread Pizza, and Meat Lovers Breakfast Pizza are on my radar to try soon too. I love having lots of tasty pizza recipes in my recipe box. I don’t think it could ever be possible to have too many pizza recipes. 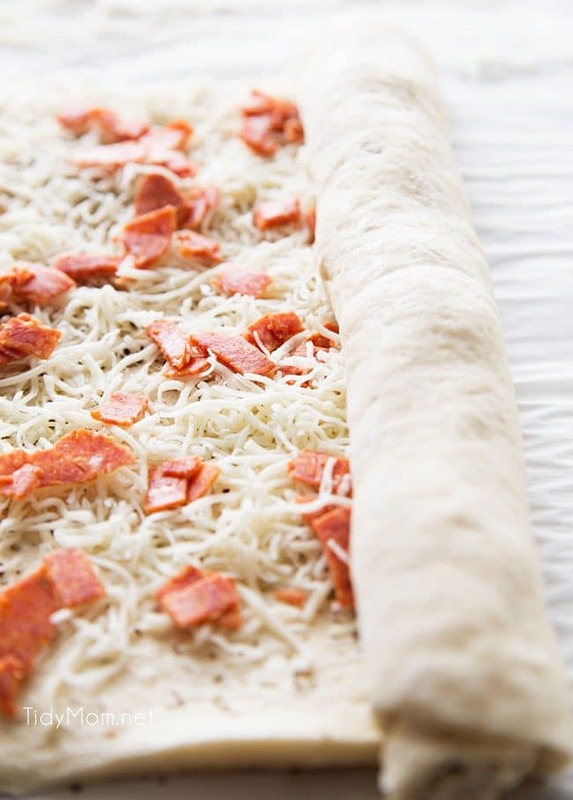 Dust a large cutting board or piece of wax paper with flour and roll out each pizza crust. Season each crust with garlic salt and Italian seasoning. Place pizza rolls on lightly greased pan, sprinkle with a little more cheese (optional) and bake for 10-12 mins. Serve with pasta sauce for dipping. Do you make homemade pizza? What’s your favorite way to eat pizza? favorite toppings? 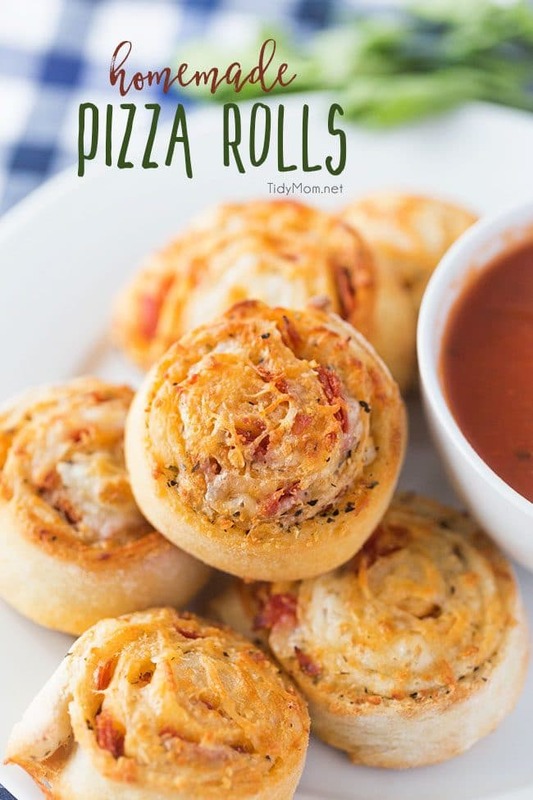 LIKE THIS HOMEMADE PIZZA ROLLS RECIPE? PIN IT! Hi TidyMom! I featured these pizza buns on my blog this week! Looking forward to trying them out! These should freeze well, right?? I don’t remember where I found you through, but I just found these today (maybe ucreate?!) and I made them this evening. They were delish!! Seriously, so easy and so good. Thanks so much for sharing!! A friend who likes to cook sent this link to me. Cooking isn’t my favorite thing, but this recipe looks easy and I’ll bet it tastes great. I’m going to try it over the weekend. Nice blog, by the way! These would also be great partyfood! Oh this looks wonderful. I am sure my youngest will love this recipe. thanks for sharing. thanks for sharing my youngest will love these. I made these tonight with sausage…so yummy!! I managed to burn the bottoms though…suggestions? I love using a stone pan. I have a Pampered chef one that is just like a cookie sheet and a mini version. Nothing ever burns and everything cooks evening. Pampered Chef Baking Stones are the best out there. Made in the USA and are 100% pure clay…no lead. They will bake everything evenly. My suggestion if using the canned pizza crust dough is to sprinkle a little of corn meal on the cutting board before rolling the dough out. Makes the dough chewy like real pizza dough. I think it depends on how big you slice them. I got 9 out of one roll and 7 out of the other. Enjoy! Made this tonight with my homemade pizza crust and it was a big hit! Interesting! Never would have thought of that. We usually use the Croissant rolls and roll some cheese and meat of choice in them and bake them as instructions for the rolls state. We’ve also made our own pizza by using the Jiffy Pizza Crust mix then putting whatever toppings on it that we want and baking it that way. Either way, it’s always pizza and always good! Thanks for sharing!!! My oven always burns things on the bottom. I’ve started putting an empty cooking sheet on the rack below the rack my food is on – and that keeps bottoms from burning. I love your pumpkin butter. I just made it! Thank you! I saw your pizza recipe. I do something similar, but I like to make my own pizza dough and sauce. It is an incredibly easy recipe and very delicious. I got it from Hungry Mouse I do make my own pizza sauce with garlic, tomato, bell pepper, onion ahead of time and then freeze until I am ready to use for pizza roll ups. And we have six children so we make this a lot! Hard to eat Papa Murphy’s or some other franchise pizza when you can make your own! Made these tonight using a local pizzeria’s frozen pizza dough. Used turkey pepperoni and added diced green, yellow and red peppers. Really, really good. Will be making this recipe often! I think this is a dish that kids would really like! It’s a fun way to eat pizza. Love making my own pizza dough. 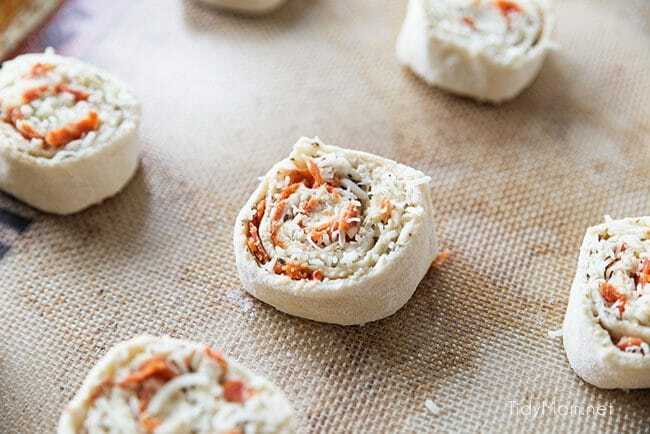 I’ve only used canned dough once and I felt it really lacked compared to homemade dough, but this seems like a really great way to use the dough in a simple, quick dinner. Awesome idea! My kids love when we make these!!! Going to make these for our homeschool Valentine’s Day party! I have made these twice and they have been a hit each time! Yesterday, at a Valentine’s party they were ravished – everyone loved them and kept asking how I made them! Thanks for sharing! These are fantastic!!!! This is best recipe I’ve found on Pinterest and it was easy. I am in happy food coma right now. Loved it! Have you frozen them to eat later? If so, these would be great for my stay-at-home son to feed his son as a snack! I haven’t, but I would think you could totally freeze them!! – If you try it let me know and I’ll update the recipe with the info! I have frozen these before and they are great, but make sure you cut them in their frozen state first or you will end up with a big mess. You can also make these with a quick and easy homemade pizza dough which you can use right away or let rise for an hour or so. Here is the recipe I use all the time with the grandchilden. Just popped them in the oven! I found it easier to wrap the rolled dough with wax paper around it (like a candy) and then pop it in the freezer for a few minutes. Once a little more stiff I cut through the wax paper. Adding that little step made it soooo much easier for me! 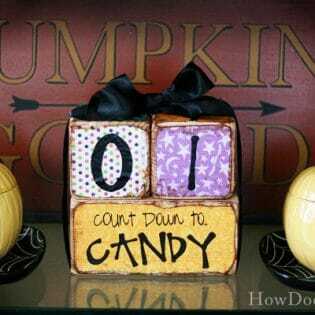 I just keep finding more things here that I want to make! 🙂 Tonight we made these, in a couple different variations. One with corn… yep, corn! lol Another I used leftover beef and made a spicy garlic sauce (very good!) Thanks and I’m sure I’ll be doing more soon. These are so yummy. My kids love them! I have made it three times and it gets better every time. I make my own doubt in the bread machine which is yummmmmy! Thank you for such a great idea. These look amazing. How can you go wrong with cheese and tomato sauce. I can just see my family sitting around watching the game and eating these amazing pizza rolls. Cant wait to try these! Ragu sweet tomato basil is Yummy! I know this is an old post, but I want to make these for a christmas party at school and was wondering if it would keep for a couple of hours? Would hate to have it dry out by the time the kiddos get to it. oh sure – we eat them left over for a few days even!! enjoy!